Darker than Black is set in a world where certain people have been given powerful psychic abilities due to the appearance of the "Hell's Gate" in Tokyo. Unbeknown to the public, these people are called Contractors who are being monitored by the government in order to ensure that their powers are kept in check. The series revolves around Hei, one of the world's most powerful Contractors who is only known as BK201 and is assisted by his companions, the blind doll Yin and Mao the talking cat. The storyline feels like it has been taken directly from a Manga story due to the mix of superhuman powers and that of the supernatural and is your classic Anime tale as it has a variety of strange and otherworldly facets thrown into the mix. The key to the series is that these Contractors must "pay" to use their powers, generally through self mutilation or some other obsessive task. The characters are quite interesting and dynamic, whether it's the dark Hei who keeps his secrets close to his chest or the blue haired Yin who plays the Ying to Hei's Yang. Of course, for comedic value, the talking cat is definitely a strange creature yet is heavily focused from Anime lore. The animation is quite impressive and "dark" for this series that uses great character designs and some impressive background environments that goes hand in hand with the majestic musical score by Yoko Kanno. The only problem with Darker than Black is just when the series starts to go into high gear, it ends and you will definitely need to purchase the next instalment of the series. The special features include art galleries, cast auditions and your standard anime extras which neatly rounds out this Anime series. At the end of the day, although it doesn't add anything new to the genre, it seems the creators stayed on the safer path which most fans of this genre will enjoy. 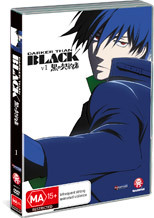 Darker Than Black v1 features all five episodes from the series and boasts twists, drama and that classic anime experience which is definitely for those anime fans who love the supernatural in the modern world.